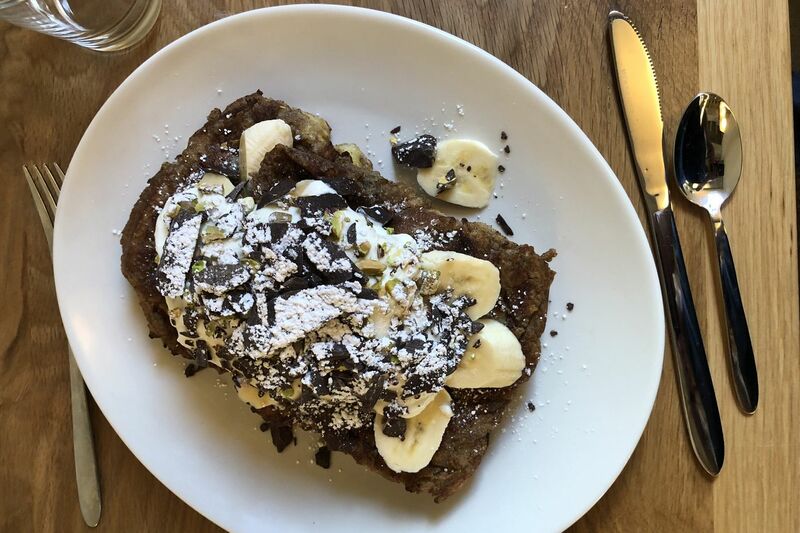 Cannoli French toast at Cafe Lift, 724 Montgomery Ave., Narberth. Michael Pasquarello began his restaurant empire 15 years ago with a bruncherie called Cafe Lift — so named after the hundred-year-old lift elevator in the entrance of the building, in a former factory on 13th Street north of Callowhill. Since then, he and his wife, Jeniphur, have opened Prohibition Taproom and Bufad up the street, Kensington Quarters in Fishtown, and KQ Burger in University City. Cafe Lift, 724 Montgomery Ave., Narberth. Now they're set up on the Main Line with a second Cafe Lift, which opened Aug. 6 at 724 Montgomery Ave. in Narberth, in a former Royal Bank branch. This location, which also has a vaguely industrial feel and garage doors leading outside, is open from 7 a.m. to 3 p.m. daily. It's somewhat of a surprise, then, that unlike virtually every other brunch specialist out there, this Cafe Lift has a liquor license, so cocktails are available. Pasquarello explained that his business partner had the license and wanted to put it to use. The restaurant includes 75 seats inside and 35 outdoors. There's also free parking. ‪Most menu items will be the same as the original Café Lift, with the addition of hand-cut fries, a fried chicken sandwich, oatmeal, and gluten-free bread options. Chef Josiah Richmond is also turning out an egg cheesesteak, which piles shaved ribeye, caramelized onions, mild Provolone, Carter's spicy mayo, and an over-easy egg on a pretzel bun ($13). Coffee counter at front of Cafe Lift, in Narberth. Michael Pasquarello (far left) explains the espresso machine to employees at Cafe Lift, 724 Montgomery Ave., Narberth. The beverage program includes exclusively East Coast beers on draft. Cocktails ($9 and $10) include a kombucha made for Cafe Lift by Baba's Brews. Some cocktails are made with cold brew coffee (including a negroni) and prosecco (mimosa). There's a focus here on kids — the Pasquarellos have two and one on the way. In addition to a kids' menu, there is stroller parking area, and wiki sticks and coloring books. Chef Josiah Richmond with an egg cheesesteak at Cafe Lift, 724 Montgomery Ave., Narberth.